Koh Chang and the surrounding islands to the south are much admired for their amazing display of beautiful natural resources, birds and wildlife. With over 50 islands the area is quickly becoming one of Thailand's top destinations for those wishing to explore the stunning scenery of the gulf of Thailand. The islands in the Koh Chang National Marine Park are home to some spectacular coral reefs and a wide range of marine species. The tropical climate helps the cultivation of fruits, such as sweet and fragrant Ramburtian, Pineapple and Sala. The many small islands surrounding Koh Chang provide many opportunities for a variety of Boat Trips to white sandy beaches, for Picnics, Snorkeling and Diving. This large island, also Known as Ko Kut, is the second largest island in the Trat province and the fourth largest in Thailand. Koh Kood, Thailand's eastern most island and is 80 kilometres southeast of the Thai mainland and close to the border with Cambodia. 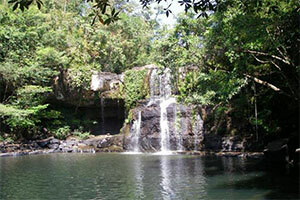 The island is covered with tropical forest and there is a beautiful waterfall, Klong Chao, in the interior. Koh Kood has little development and some stunningly beautiful beaches, crystal clear waters, and its intact coral reefs. Diving and Hiking are popular activities, as is relaxing in the islands tranquil atmosphere. 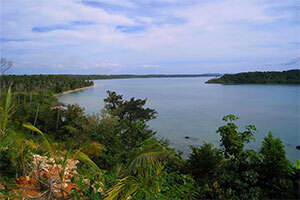 This medium sized, largely flat, Island is covered in rubber and coconut plantations with lovely long sandy beaches. 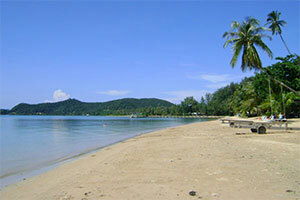 Located between Koh Chang and Koh Kood, Koh Mak, is about 40 kilo meters from the mainland. 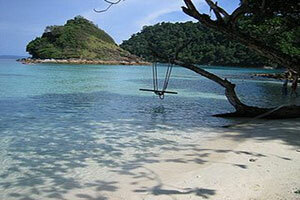 Visitors are drawn by is convenient location to Koh Chang and its cheap accommodation. This small island has a crescent shape to its western coast, where the main beach is located. 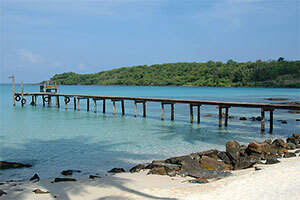 Koh Wai has two small but pleasant beaches and is a great island to go for a day trip. Accommodation on Koh Wai is limited as there are only 2 resorts. Only 20 minutes south of Koh Chang the island of Koh Wai offers a beautiful remote beach getaway with clear blue pristine waters. 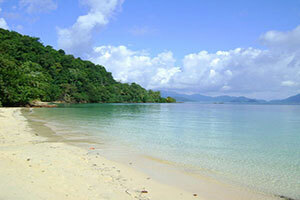 Koh Wai is a popular destination for day trips and is only 20 minutes from Koh Chang by speedboat. Snorkeling, Swimming and canoeing are popular past times, as is lazing and relaxing on the scenic beaches and taking in some of the beautiful screener. The North of the island offers some stunning views great views of Koh Chang's mountainous southern coast. 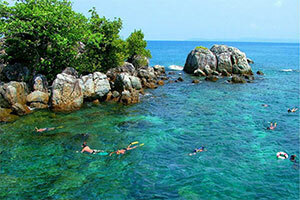 Part of the Koh Chang National Marine Park, this group of islands is excellent for diving and snorkeling. The Islands boasts one of the most beautiful coral reefs, which is home to a wide and diverse eco-marine system. 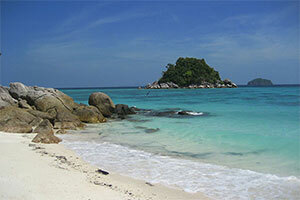 There is no accommodation on these islands but tours can be arranged from Koh Chang, Koh Mak and Koh Kood. Koh Rang the largest island is covered with tropical virgin rainforests and boasts one of the longest and most beautiful beaches in the area.